Pathfinder Battles: A Huge Announcement! This week, WizKids—our longtime partner for prepainted plastic Pathfinder miniatures—announced the first set to be released after the launch of Pathfinder Second Edition in August of this year. Pathfinder Battles: Legendary Adventures features 44 figures ranging in size from Small to Huge based on all new concept art for the next evolution of Pathfinder, much of it by iconic artist Wayne Reynolds himself! Yes, you read that right. For the first time since 2012's Pathfinder Battles: Rise of the Runelords set, non-premium Huge figures will be included among the randomized figures in the set. Unlike the 2012 set, however, you won't need to buy a Huge booster, but rather will get either a Huge or Large figure in every four-figure booster. While it's still early to begin previewing this set (we're still looking at April's Pathfinder Battles: Ruins of Lastwall, after all), it would hardly be an announcement befitting such huge news not to show off at least a few of the new figures in the set. Check out the Dragon Turtle (Huge uncommon), Chimera (Large uncommon), Fire Giant (Large uncommon), and Dwarf Sorcerer (Medium rare) for a sample of what's coming in September! The premium set releasing alongside these and 40 other figures is Pathfinder Battles: Legendary Adventures Goblin Village, which features tents, wooden palisades, and a number of other accoutrements and decorations befitting the game's most recognizable little trouble-makers. While I don't want to give away too many of the village's features in favor of a later reveal full of all the Easter eggs and continuity callbacks they represent, here are a few samples, including the palisade gate, a large tent, a pickle barrel, and a junk pile. But you don't have to wait until September to get your mitts on minis from Legendary Adventures! 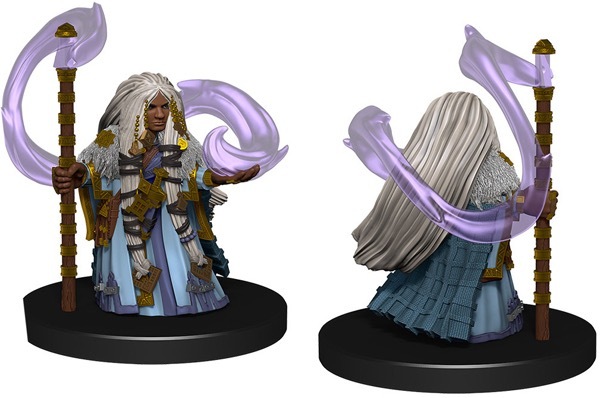 A non-randomized set of eight alternative paint figures will be available in the Pathfinder Battles: Legendary Adventures Preview Pack a month earlier to coincide with the official launch of Pathfinder Second Edition. 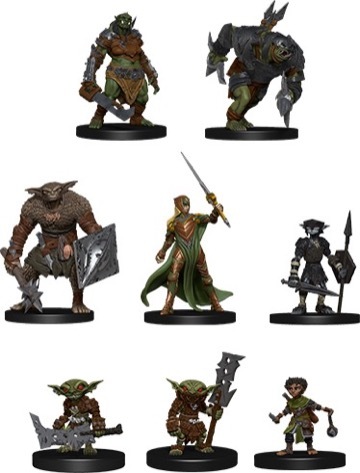 These figures are the Goblin Dog-Slicer, Orc Charger, Bugbear Skulker, Orc Battler, Goblin Guard, Hobgoblin Soldier, Armored Elf Soldier, and Halfling Slinger. Notice the redesigned orcs and hobgoblins, and killer goblin and elf armor, all courtesy of Wayne's second edition concept sketches! We'll have a lot more about all three of these products in a few months, so stay tuned. WizKids has some truly legendary adventures in store for you this summer! Thanks for the great preview, Mark! 1. What do you mean by the "Legendary Adventures preview pack" being alternative paint figures? Are the same sculpts part of the regular "Legendary Adventures" set, only with different paintjobs? 2. Will "Legendary Adventures include a huge "Aboleth" mini? If yes, i'll order two cases & 2 incentives. The Goblin cCamp is looking good. The pickle barrel is a great touch. Thanks for this massive preview! Love the new orcs too. I can sense my wallet cringing already! I think it's pretty save to assume that there will be 6 large & 6 huge minis in the set (the next IotR set is the same). Four of each will be uncommon and two rare. I was going through all six Bestiaries yesterday and i noticed that almost all huge creatures which aren't super-obscure are in the first Bestiary (a few in Bestiary 2). Wow. I have no words. These look amazing! 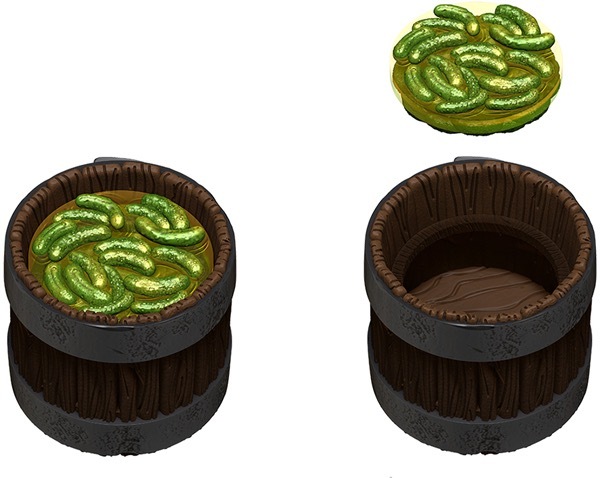 I love the new designs and I'm so hyped to get that goblin village! The hobgoblin redesign is super nice. Makes them less like LotR orc/goblins and more like medium sized Paizo goblins. I hope their lore doesn't change tho. The Ruins of Lastwall product page is now up. The link for the case incentive leads to the same page though. You are now able to start a Pathfinder Battles Case subscription with either the "Kingmaker" or "Ruins of Lastwall" set. I like that the orc was updated after the sketch was previously shown, good job. Love the chimera and fire giant. -Dragon Turtle: While it is great to finally get a never before done mini of this CR 9 dragon, i am not a big fan of the tranlucent water in this case, as the creature has a land speed of 20 feet. Still, i am glad that we get this mini, as DnD 5e changed the size to gargantuan. -Chimera: It's great that we finally get a chimera with a red dragon head, as the old D&D one (War of the Dragon Queen) has a black dragon head, the ones from "Heroes & Monsters" has a green dragon head and the one from "Wrath of the Righteous" has a white dragon head. -Fire Giant: This third male fire giant after the ones from "Shattered Star" & "Lost Coast" will make for a good low level mook, even if i rather had a female one. -Dwarf Sorcerer: The picture says Dwarf Wizard, but i suppose it could be one or the other. It has great details and i am glad it is a rare, as it looks pretty unique. The base looks like a small base to me, but as you wrote, dwarves are still medium. I like all four renders and combined with the Village & the 8 other minis, this looks like a solid set of which i could see myself ordering not one, but two cases - depending on the other five huge uncommon minis. What. Are. You. Doing. Paizo?! We already have 2 different Chimeras from 2 previous sets. 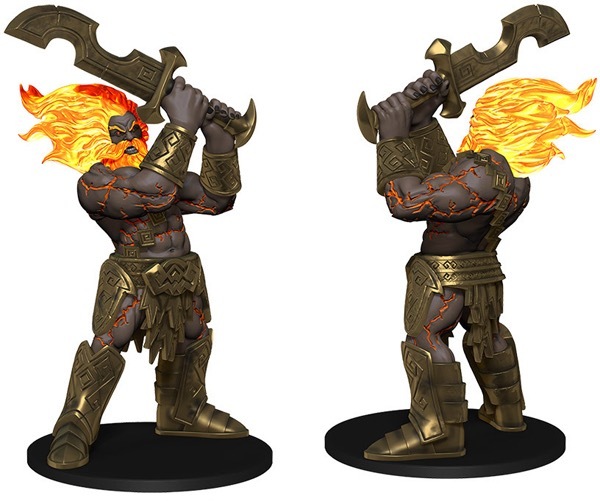 We already have Fire Giants from 2 previous sets. We have more goblins than we could ever need from several various sets. And multiple Bugbears from Rusty Dragon Inn. Please, if you want me to continue to be a case subscriber, give me diversity! You still haven't made your advanced races. Sylphs, Oreads, Ifreeti, Undine, Wayangs? And I swear, if you announce 1 more troll, I am done. Successful Troll supports this initiative. Looks like the dragon turtle figure has acupuncture needles. nice incentive, great we finally get more huge minis. but really, there would have been time for more goblins when the We be Goblins builder set had sold out. Agreed. I don't need any of these. The only "new" miniature shown is the dragon turtle. Also enough with the decor incentives. I don't want. Please bring back Gargantuan minis. And a preview pack that is just repaints? Boring. Why bother? I'll probably still buy the set though, because I just can't help my collector OCD. It would seem that Trolls and Minotaurs have a rich history of over-representation dating back all the way to the beginning of PPM. It is futile to resist! Their unions are strong. I was not sure about the chimera, but Marco made a good observation that it is a new chromatic head. Now I kind of want one more to get a blue dragon head version. Every mini set is someone's entry into miniatures, so I get the need to rotate in commonly used creatures. But every mini set is in addition to every set I've bought before, so I really need to see new things to stay interested. I think the chimera is a good compromise. It's a returning creature with a twist. I still need to see creatures and class/race/gender combinations I haven't seen before and I need them to make up a hefty chunk of any set. Every mini set is someone's entry into miniatures, so I get the need to rotate in commonly used creatures. a look at Paizo‘s own store should give a hint what is definitely not needed. just from a supply and demand point of view they could stay away from anything still available in their own shop without having beginners miss out and at the same time clear the shelf. and just how long is a chimera going to be on the table? the ones I encountered didn’t last 10 rounds. for less than 10 rounds I don’t need the color of the figure match the one of the encounter. This one does look much better than the H&M one, which means I could want it as a replacement. But then I have the H&M ones left over and de-valued for the secondary market because this one, and the WotR one, are covering the supply side. 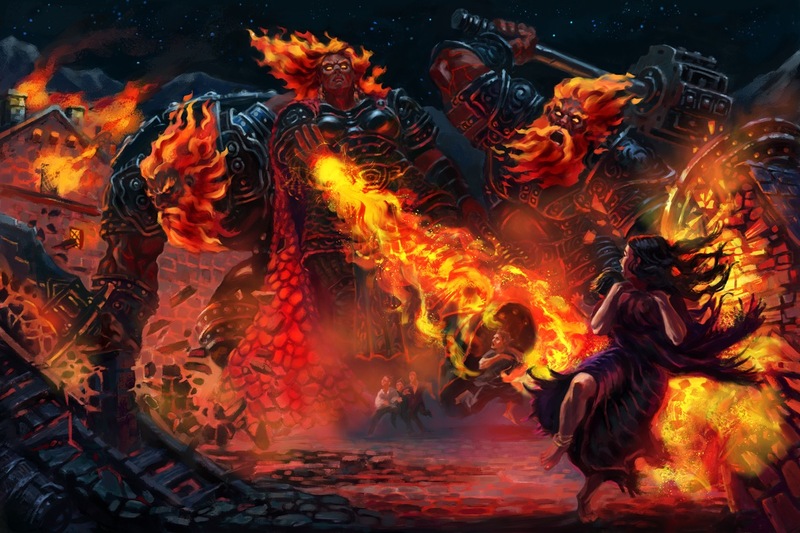 Does anyone else think that the Fire Giants and Frost Giants are just too darn big to be classified as "Large-sized" anymore? Maybe they need to be given a size boost to "Huge" in the new edition? I mean, their slightly bigger than cobble stone double story buildings now! Nice, I’m probably gonna need 2-3 sets of the goblin village! Minis are looking great, though I echo the sentiment that giants should be huge. ICV2 had a good article showing off the minis in the preview pack. The little detail in the hobgoblin’s necklace and belt are very cool! Since the Preview Pack has a price in line with the iconics, I imagine the alternate paint means more detail vs regular Battles paint. Were this a normal set, i would 150% agree with you. But i suppose as this is the initial set for "Pathfinder 2.0", it has to supply some very basic creatures for people that start playing with this edition. The change is most apperant with the "Hobgoblin" (which i don't like at all), but all of the goblinoids look slightly different than before. For me, it is okay if two new goblins are in this set (i suppose we also get an obese chieftain & maybe a female because of the incentive), but i get what you are saying - i have about 50 Pathfinder Goblins. But alone for the six new huge minis and also for the first female orc in ppm, this set is already looking better than "Kingmaker" & "Ruins of Lastwall" for me. But going forward, Pathfinder Battles needs to tone down on doing old creatures again, i agree. D&D is doing a great job on adapting every creature from 5e into ppm, they will probably be done in 2020 (excluding the gargantuan creatures). I also wish, like many others, to get minis of the more obscure player races. Do one uncommon male & female version of (for instance) Kitsune and another race per set and everyone will be happy. And, not once have I felt we have too many goblins. I will continue to scoop up several of each new sculpt, preparing for the goblin appocolypse I am sure must occur someday. I guess this is a nostalgic obsession with my early days of role-playing where 100 goblins might pour out of a 10 x 10 room! Back then we used six sided dice as the goblins, with the number on top representing their hit points. I'm very happy to see the sets go with a large/huge split. WizKids seemed to be experimenting in that direction in the Icons sets. Since budgets can be spread across the set and rarity this opens up a lot of possibilities. Obviously over hanging figures such as the Water Lord Huge Elemental doesn't fit in that method, but it allows less massive and simpler figures that wouldn't be as good a draw for incentives or special release sets. Seeing repeats is less interesting, but at least they look different and hopefully isn't too much of a pattern. Plenty of gobs is going to be alright with me. I wonder if the hobgoblins have much of a change other than appearance. Paizo doubling down on their iconic goblin look is probably a good idea as they pull further away from 3.x DND. I wonder if bugbears would have been more interesting with oversized heads as well. The goblin village is nice, but the play sets are starting to dominate. I would prefer to alternate. There are still plenty of awesome gargantuan creatures to feature. Overall, I'm excited to see the new direction even if not everything is getting me full barrel yet. I am very curious about the future of the PFB incentives. The last three sets (Kingmaker, Jungle of Despair & Maze of Death) had HUGE minis as incentive(s). The set before that (Crown of Fangs) had a combination of "Dungeon Dressings" & creature miniatures. The set before that (Deadly Foes) also had two huge minis as incentive. The set before that one (The Rusty Dragon Inn) was the first set ever to feature a "dungeon dressing" playset incentive. June 2015's "Dungeons Deep" set was the last time that a PFB set featured a gargantuan creature. 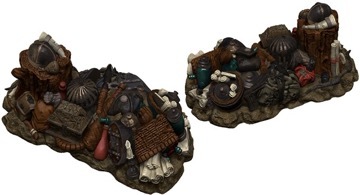 Even D&D's "Icons of the Realms" sets jumped on the train with january 2017's Monster Menagerie 2's "Adventurers Camp" and they have been exclusively doing "playsets" since then, with the only half-exception being the "Kraken & Islands" incentive from the "Monster Menagerie 3" set. The thing is: Dressing incentives seem to sell better than gargantuan creatures, which is not surprising when you consider that a single gargantuan creature will probably be used once or twice on the table and dressings are gonna see a lot of table time. Personally i think that there are still a few gargantuan creatures that should be done as miniatures, but it only makes sense from a commercial standpoint if this creature is featured as a boss encounter in the adventure on which the miniatures set is being based. D&D is seemingly doing that with the "Kraken" & "Falling Star sailing ship", as their next hardcover release will be a collection of older nautical adventures updated to 5e. From the devout Lastwall Paladin to the cunning Skeletal Samurai you will find no shortage of allies & enemies. But that’s not all! Be wary of the skies, adventurer, lest you be devoured by a Large Time Dragon! How many palisade walls are part of the incentive? Is it possible to build a circle with one set or do you need two? I have two "Rusty Dragon bar" sets, which allow for a much nicer setup. I’d consider buying another set on top of the number of pallisades just for the tents, depending on the numbers. Number of pallisades is not as important, as I‘d be willing to just use a paper pallisade for the sections without a gate. Seeing the "Armored elf soldier" made me realize how bad i want a "vanilla classic" adventure path with dwarves & elves having troubles with each other before teaming up against a common enemy (with the pc's right in the middle). How cool would it be if the first or second adventure path would take place in Kyonin & the Five Kings mountains and "Treerazer" would be the end boss?